Andrew and I were at Alameda last weekend (he’s our resident tech guru and wanted to see a real live antiques show). In case you haven’t heard of The Alameda Point Antiques and Collectibles Faire (I hate that extra ‘e’), it’s one of the largest and best get-togethers on the West Coast for people who want to browse, buy and sell a wide range of antique and vintage items. It’s held monthly, rain or shine, on one of the WWII era runways of the old Alameda Naval Air Station. It’s got sweeping views across the Bay of the San Francisco skyline. I’ve been going for years. Normally when you enter the gates of Alameda, you pretty much expect three hours of walk-around to look at all 300 or so amazing vendor booths. And usually the first couple of rows I’m half asleep and don’t find anything great. So imagine my surprise when in the very first row, out of the corner of my eye, I spotted a perfect acquisition for our office (given that we need a new accounting system anyway) – a 1908 Burroughs adding machine. It was the beveled glass that blew me away. 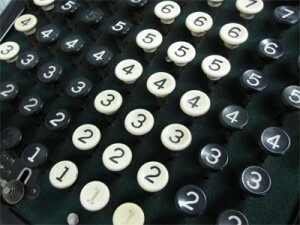 I’ve seen plenty of antique adding machines before – most notably the Comptometer, a very cool device invented by Dorr Eugene Felt. But they’re usually not that eye catching. This Burroughs thing was an amazing beast, with see-through sides so you could see all the inner workings, and a cast-iron frame and porcelain finish that just reeked of quality. Finally, the Burroughs stencil on the inside front of the glass was perfectly intact, after 101 years. How much would they want for this amazing beast? $400? Nope… $40. Sold! About a dollar per pound. And a bargain compared to the $450 it cost in 1908, as I learned by researching it later that day on the Early Office Museum website. 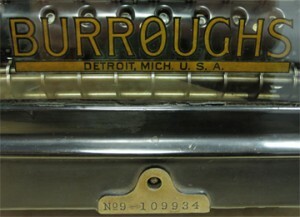 These Burroughs machines were the supercomputers of their day, selling by the thousands to large companies – too bad we can’t figure out how to work it! The machine had a lot of grunge, but cleaned up nicely. The handle (which makes a great sound when you pull it) comes out, allowing you to pull off the top and clean the insides of the glass. Inside I found the date 7-16-08 etched into the metal (not 2008!). The 100 year old green felt beneath the key was a little harder to clean… but worth it. Now if we only had some green eye shade! P.S. I also picked up an antique ships foghorn, patented 1901 by L.D. Lothrop of Gloucester, Mass, a major fishing community just north of where I grew up. The mechanism (bellows) is self-contained in a simple wooden box, with a metal horn on the side, and it still works. And it’s loud! Perfect to sound the alarm in case of imminent collisions, or accounting irregularities! My husbands family have all passed and last year we acquired all the properties and business (Walters Okla). They ran the barber shop there since late 1940. When we went into the house (one of the oldest in town) I was overwhelmed by the massive amounts of what I thought to be clutter. At first we were going to back up a truck and haul it all off, but as I began to look around I was amazed at the collections of things. 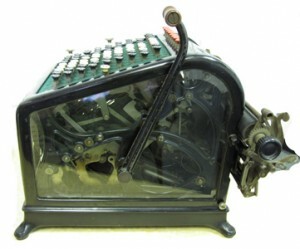 We have this adding machine along with others, and very old typewriters, etc. It was like walking into the early to mid 1900’s. It’s been 1 1/2 years and we still don’t have the house emptied. We have four (going on 5) storerooms full. Two 1926 Koken barber chairs in excellent condition, brass & porcelain and many old barbering items (we sold the shop and kept everything inside). What amazed us me is the number of different things she collected & some are just things she used and had in her cabinets and cupboards from the early 1900s to the 1960s. I don’t think she owned a modern appliance purchased after 1965. We have absolutely no idea how to liquidate these items without selling something potentially valuable for a dollar. We are not collectors, and with 3 deaths in the last year, it has depleted us to pay for costs of probate and burials etc. I don’t mean to sound callous, I loved them & some of the senitmental items we’ll keep, but we don’t have a clue about how to value or sell these wonderful pieces of american life. The estate auctions we’ve been to here, they just box it up and sell it in groups. I’ve researched many of the things and have seen some of the items in antique books and selling online for quite a bit. Would you have any advice on how we could go about this? I would appreciate any help or advice. “ ” Nostalgia has always been harnessed or packaged to sell things.